The Dubai International Boat Show, held recently, excited considerable interest and exhibitors reported striking sales deals with many companies pointing to a high proportion of serious buyers at the event. UK-based manufacturer Princess Yachts said this year was its most successful appearance at the Dubai show. “I think this is one of the best Dubai International Boat Show editions,” said Simon Colebrooke, its international sales manager. “We’ve seen a lot more serious customers than in previous years. Princess brought several new 2016 models, mostly mid-sized yachts to the Marina Display, ranging from about 12 m to just over 26 m in length: the Princess 88 Motor Yacht and Princess 68 Flybridge, both making their first appearance at the show; Princess 56 Flybridge, 52 Flybridge, and 43 Flybridge; and the Princess V39. At the start of the final day, the company had around Dh10 million ($2.72 million) in firm sales, with Dh20 million in follow-up from the event. Two contracts have been signed and three are in negotiation, with a sea trial booked for the near future. Similar sentiments were shared by other exhibitors of large yachts. UAE-based Gulf Craft, with the biggest display in the marina, was predicting strong final results compared to previous years. “This has been another spectacular year for Gulf Craft at the Dubai International Boat Show,” said Gulf Craft’s chairman, Mohammed Hussein Al Shaali. “We were expecting there would be some hesitation among buyers, but the market is showing a great deal of resilience. Gulf Craft is in a strong position, with brands that serve the diverse requirements of our customers, enabling us to seamlessly adapt to shifts in the market. Craft of medium-to-large size that offer added comfort and space have seen considerable interest this year, with a great deal of attention for our Nomad Yachts long-range series,” he noted. Attention to detail across manufacturing, design and service standards were cited as pivotal to success in the Middle East, with the most successful brands benefitting from a long-term commitment to the region. 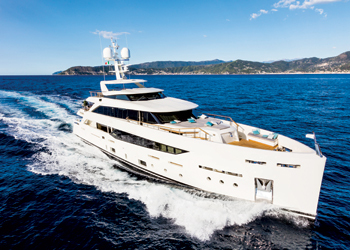 Along with quality, Gregor Stinner, CEO at Art Marine, the regional distributor for Ferretti Group yachts, adds innovation. Among the exhibitors selling small to medium-sized boats, most reported that sales were consistent with previous years. Wassim Zein, founder of Abu Dhabi-based Hayaari Marine, said the company had netted some good sales, taken deposits, and also secured a few solid orders. At Delma Marine, one strong outcome was for its Boston Whaler 420 – one of the 23 regional launches at the show. “It’s sold already,” stated Waseem Ben Khadra, the general manager for Dubai and the Northern Emirates. Having something new to offer, and giving people a reason to buy at the show, gave brands a definite advantage. “We have offered some good deals on boats and also on engines, and we have some good interest in the marine accessories. People are cautious at the moment, and business at the show has been better than we expected,” he added.